The beginning of 2018 is finally here and it's time for me to get serious to start writing again. I really didn't want to start blogging again but I feel it's the only way for me to stay accountable to myself. I did end 2017 with a 2.2 mile walk on December 28th. I'm having to walk again because it has been so long since my last run. I did not start off this year with a walk or run. Instead, I went to eat breakfast with lots of my running friends. It was a resolution run, however, the weather was so cold, many of us decided that it was better for us to not run. It didn't get much better up in the day either. Now to let you know what has happened over the last two or three years. Life happened in 2015 and I just didn't have much motivation to get out and get it done. We all know what happens when we stop doing something for a week or two. We are all of a sudden not doing it anymore. I really haven't walked or ran much in the last two years. In early 2016, I found out that I had high blood pressure and then this past October I found that my blood glucose was really high and had to start taking medicine for that. I started getting serious about my health the first of November. I changed my diet and haven't had any sugar from cake and other sweets in two months. My sugar is now within normal range and I intend to keep it there. Since the beginning of 2017, I have lost about 45 pounds and am below my pre-marathon weight. My goal for 2018 is to cover 500 miles anyway I can get it. Walking, running, or biking. 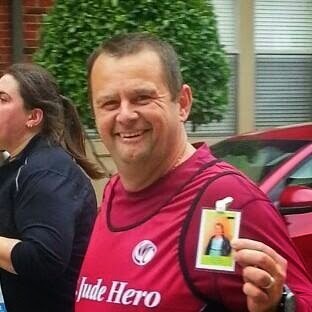 This past weekend was the St Jude Marathon Weekend in Memphis and I ran the half marathon instead of the marathon like I had planned, as a hero. As I sit here on Sunday night writing this, I really don't know where to begin. I posted on Facebook shortly after the race that I had so many thoughts and emotions about it and one friend wanted me to share. A thought a blog post was more appropriate than I Facebook status. I woke up at 4am and just couldn't go back to sleep. I just tried to relax and watched some television and finally got up about 5 o'clock. Jason was going to pick me up and we were going to make the trip to downtown Memphis together. After breakfast sandwich from McDonald's, I was ready. We met some of the runners on our team, Team Corinth, in the Double Tree Hotel lobby and had a good visit with them. , we still count it. Thankfully we didn't have to wait long to actually start our race. It was about 20 minutes after the gun went off. I couldn't believe all the people that were lined up along the streets! Many holding signs and many cheering! The weather was cool and it got worse. Along the river, the wind was blowing and I got really cold and then finally the wind calmed down. Unfortunately, it picked back up again and never died down again. One of the most amazing parts of the course was on the St Jude campus. The emotions that I felt as I saw those kids and gave many of them high fives, is more than I can describe in print. After I exited the campus, I wanted to just sit down and have a good cry. I carried a picture of a little girl with me the entire race. I was thinking about her and her family and just when I wanted to quit, I'd look at her smiling face in that picture and keep going. The energy along the course was awesome too! As a St Jude hero, we committed to raising money for St Jude and got to wear a special singlet that identified us a such. Many people along the course were shouting, "Thank you heroes!" These people were thanking us! Although I felt like, to borrow Jeff's term, a superstar, those kids and their familiar are the superstars. We as runners endured wind, rain, heat, cold and many other things during training, but these people that we thanking us, endure far more than I as a runner will ever endure. I am so thankful I have the ability to run and can use it to help a great cause. This was my final event of 2014 but it won't be my last St Jude event. I am so looking forward to running again next year and helping the kids. Thanks for taking the time to read this post and if you have comments or if you ran this race, please share your thoughts in the comments below. As most of you know, I ran my first marathon just over 5 months ago on December 14th in Huntsville, AL. The thought of running a marathon wasn’t even a possibility just three years ago. I didn’t even think I’d want to run more than a 10K. Fast forward three years and I am a marathoner! I’m not saying that to brag but to encourage you. If you set your mind to do something, then it’s possible. I’ve read many times, “The body can do anything. It’s the mind your have to convince.” When I first took those first steps on October 1, 2010, I would have thought you wee crazy if you would have told me I would run one day. I just wanted to walk and get healthier. I thought me walking 3 miles was impossible but it wasn’t. I learned many things about myself over the course of training for and running that 26.2 miles. I’ve shared some of those things in past post but there is another person that doesn’t get much credit for the sacrifices she makes. 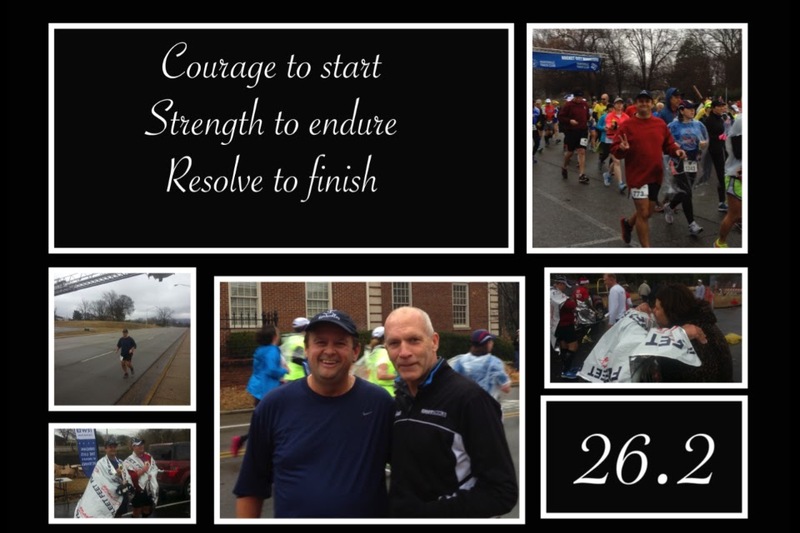 For Valentine’s Day this year, Tish put together a collage of photos from that marathon and stuck a quote on it. The was just the frosting on the cake. Training for a marathon isn’t easy. If it was then everybody would be running marathons. It takes so much out of your physically and mentally. She had to put up with me getting up early on Saturday and Sunday to go and get my run in. Although I’m sure she would have much rather me be at the house, she endured all the hours that I spent out pounding the pavement to accomplish something that was important to me. She has even had to come and pick me up a few times because I’d call her and tell her I could make it any farther. One of those time was during what was supposed to be a 20 miler that turned into a 16 miler. The quote that she put on the collage was, “Courage to start. Strength to endure. Resolve to finish.” When Jeff asked me about doing the Rocket City Marathon, I really wanted to say I didn’t think I could do it. Just a couple of months before, I had told Koach that I didn’t think I had time to train for a marathon and that I was sticking with half marathons. He understood. Jeff had faith that I could do it. Courage wasn’t about putting my name and address into the online form to register. That was easy! It was actually pressing that SUBMIT button and then doing what it took to make it to the start line. Strength to endure was something we all need in all walks of life. It doesn’t take just physical strength to finish a marathon. It takes mental strength too. I found that out late in my training while trying to finish those long long 17, 18, 19, and 20 mile runs. It was hard at times to get up at 5am and hit the pavement an hour later and stay out there until almost noon. Planning your route carefully so you could either stop by the store or the house for hydration. Resolving to finish is one of those things that is easy to say but hard to do. I had it in my mind for weeks that DNF was not an option. I was going to finish! Somewhere around 23 miles, I decided that I just couldn’t go on and I was finished. The finish line was still over 3 miles away and there was no way I could make it. Jeri, one of the sweepers, said something about that time that I’ll never forget. (You’ll have to ask me about it sometime.) It made me dig deep within myself and muster up all the strength that was within me that I knew would carry me to the finish line. Finally after 6 hours 5 minutes 9 seconds, I crossed the finish line! Shortly after finishing, Tish gave me a gift. She had bought it even before I had finished. It was a tag, as she calls it, to go on my necklace. It has 26.2 stamped on it. I still wear it now and will continue to wear it as a reminder that I can do anything that I set my mind to do. The photo collage hangs next to my side of the bed and every morning when I get up to run, it reminds me of the reasons I do what I do. Thanks for stopping by this week and I hope you enjoyed this post. Comments are always welcome. The 33rd Coke 10K was held a couple of weekends ago and all I can say is “WOW!! !” I had the best time at this year's race. I didn’t run my fastest 10K but I enjoyed myself so much. In the past, I was serious about it and was racing against myself. This year was different. I decided that I was going to do my thing and whatever time I got then that’s what it was. Jeff and I met downtown to get in a couple of miles before the race and we ended up walking probably two miles or so. We really don’t know because we didn't have our watches going. We just enjoyed a good paced walked and talked. Before we went back downtown, we stopped by my house so I could change into a different shirt. It was cool that morning and I had worn a long sleeve for our meeting before the race. As we and my two oldest kids were walking to downtown, I realized I had forgotten my number! I didn’t have but about 40 minutes and we were almost to the start line. Jeff let me borrow his van to go back to my house and get my number. Now that is a great friend! After the gun was shot and the runners were off, I quickly settled into a good pace. When I arrived at the water stop just before the 3 mile mark, I saw a familiar face. At first I didn’t recognize her. It was Christina that I had ran with a couple of times before. I decided to stop and chat for a few minutes. It was good the catch up with her. I saw a guy I knew coming down the hill and told Christina that I had to go. We said goodbye and then I yelled, “Hey, Mr James, where you been? I’ve been waiting 15 minutes for you!” Everyone got a good laugh out of it. As I continued on and made it around the loop and back to the street behind the Presbyterian church, I took a couple of minutes to chat with a man that worked for the Coke company and lives on the course. I had talked to him a few weeks ago while he was out in the yard and I was out running. I also got to see the plastic fish that his grandson had caught earlier that day too. I returned to race mode and got on with my run to the finish line. After finishing I met up with family and friends and visited with a few folks that I hadn't seen in a while. The kids and I finally made out way back to the house and it was time for a shower. We then broke with tradition of going to the Mexican restaurant and went to the Chinese place instead. I honestly can't remember much of the rest of the afternoon but it had been a great day and I had a blast! The Gum Tree 10K in Tupelo was this past weekend but I chose not to participate in it because of the two previous busy weekends. I also know that if I went down there to just run the race and come home, that it wasn't gong to happen. Jeff and I met at the church and ran a few miles together. I ended up with just over 11 miles and that is all I got in all week. They were good miles and Jeff and I enjoyed the conversation together. Sorry this is a week late and I'll try and do better next week. I already have an idea for next week's post unless something else comes up. Have a great week and I hope to see you again next week! If you read last week's post, then you know that I was running the St Jude Country Music Half Marathon this past weekend. I could say so much about this event but you probably wouldn't want to read that much. I learned a couple of things along the course and was reminded of so much more too. One of the things that I learned was that there are "only" 242 days until Christmas. Of course, that was as of Saturday. I also learned that there is a club of women that have tried running before but they kept spilling their wine. You would think they would leave the wine at home during their run. One more thing that I learned and I'll move on. It was that some cities will put anything in the middle of a round-a-bout to get your mind off of the round-a-bout. And that is all I have to say about that. You'll have to ask somebody else. Let me tell you, I have never seen so many people in one place at one time in my life! Although I didn't care for the huge crowd, I did enjoy seeing all of the sights along the race course. I couldn't believe all the people that had lined the streets of the route and so many signs. One of the highlights of our stay in Nashville was getting to eat with Jeff and his family. We went to the Rainforest Cafe and had a fabulous meal. Another highlight was getting to reunite with Kade. As you may recall, Kade and I finished the Rocket City Marathon together back in December. We have stayed in contact with each other since the marathon. It was great to see him again. Now for the things that I was reminded. I know that I have touched on this in the last few months but it doesn't hurt to hear it again. I was reminded that we shouldn't take this gift of running for granted. I think I was at about mile 4 when I saw a lady in a wheelchair just a clapping and yelling for all of the runners. I just had to make my way over there and give her a high five. I don't think she saw me at first but when she did, she stuck that hand out. It made my day! Somewhere about mile 11, I was reminded again. This time it was a blind runner. The blind runner was tethered to a sighted person and was being escorted by three others. They wore bright yellow and had signs on their back identifying them. I'm so thankful to Joy Stark for teaching me the fact that running was a gift early in my "career". Each time you see things like the things I saw this past weekend, it comes as a reminder of that fact. That's going to do it for me this week. Thanks for stopping and I hope to see you again next week again. I'll be sharing about the Coke 10K then. I can hardly believe that three months have passed since I have written here. School assignments have certainly kept me busy for all this time. Now that I am out for the summer, I plan on writing here weekly. It's something that I enjoy doing and looked forward to it every week until last August. This past week I signed up for my second marathon! I will be running the St Jude Marathon in Memphis on December 6th! Am I excited? Of course, I am! Training doesn't start until the first part of August and we all know that is one of the hottest times of the year in Mississippi. Since this past winter was so cold and I didn't get to run as much as I would have liked, I won't be complaining about the hot weather. I'll just go out there, get my run in, and be done with it. I already have my entire schedule planned out and with any luck, will be able to keep up with it. Last week I posted on Facebook that I was going to post a status update but decided that the subject deserved it's very own blog post. I wanted to get this post written and posted by Thursday but life happened and I didn't get it done. With all the irons in the fire that I have, I love the challenge of juggling them all and keeping everything in balance...most of the time. Over the course of a lifetime, many people come into your life. Some stay for just a short while. Some stay for a while longer. Some remain for the rest of your life, while others were just passing through. No matter how long a person stays in your life, I believe they are brought there for one of three reasons: so you can help them, so they can help you, or both. Over the past three and a half years, I have met so many wonderful people. It has definitely been a journey. Some of them I have met in person and some I haven't. Hearing their stories have made me a better person and have changed my life for the better. Hopefully, some of the things that I have shared have changed them in some small way too. This brings me back to this post about running the RCM back in December. The three new friends that I made in Huntsville that day and my running partner, Jeff, have continued to encourage me. Since Kade, Jeri, and Dave live so far away, they encourage me from a distance and probably don't know it until now (if they read this). As I said in that post, Jeff and I had ran many miles together and we continue to run almost every weekend together. If not for Jeff, I'm not sure I wouldn't have just quit running for the winter and started back when the weather got warmer. I'm glad he was there to make sure I was out there pounding that pavement now. I could go one with so many of the folks that I have met and how they have changed my life but that'll have to wait. You don't have the time to read all about them and I don't have the time to write about them all right now. In the coming weeks and months, I will introduce to you some of those people. Many members of Team Corinth are going to invade Nashville this weekend and run the St Jude Country Music Marathon/Half Marathon and I'm so looking forward to it. I still haven't ran over 12 miles since the marathon but I be crossing that finish line of the half. I'll share with you next week what my experience was. Thanks for stopping and if you'd like to leave comments then feel free to do so below. As I sit here tonight (Saturday), I have just finished my assignments for the week and had something on my mind. Over the last couple of weeks, I have thought a lot about this gift. The gift that I have been given and how sometimes how I need to see it from a different perspective. I have thought about this the last few runs that I have done since the marathon. As Jeff and I were mingling around the lobby of the hotel in Huntsville before the start of the marathon, we see a guy come in the front door in a wheelchair. I can't remember exactly what Jeff said but said something to effect of having a different perspective. And it does!!! I have thought many times how fortunate I am able to run. I just needed to write this and I hope that the next time you see a person in a wheelchair, a blind person, or a person that has lost an arm or a leg, that you will look at yourself and consider how fortunate you are. Sometimes we get so caught up in ourselves that we forgot how things could be and then God puts a few of these people in our paths to remind us that it isn't all about us.